Luxury, romantic one bedroom with private hot tub and attached garage. Enjoy the breathtaking views of Snowbasin Ski Resort while soaking in your private 3-4 person hot tub located on the balcony off of the living room. Located in Lakeside Village, right on Pineview Lake - just minutes away from 3 ski resorts! This condo is a fully equipped luxury one bedroom, 1.5 bath with skiers in mind. As my second home, I have it decorated it to be very comfortable and stocked with plenty of Kitchen cooking supplies. This exquisitely decorated condo has rich fabrics, leathers and custom furnishing throughout for your comfort, delight and enjoyment. Flat screen SMART TVs in every room offering satellite TV. There are lots of pegs and racks for hanging ski and sporting gear. There is an attached garage w/ racks for gear, private hot tub on the balcony and full size washer/dryer. Comfortable beds, memory foam top for the sofa-bed for a great nights rest. I am the owner and care about the guests in my condo! The Lakeside Village development offers a plethora of amenities not found at one location in the area. The clubhouse is accessible to homeowners and guests providing a pool table and lounge area with fireplace to relax after a long day or recreation. Lakeside Village as two tennis courts, swimming pool, kids pool, community hot tub, reserved boat parking, beach access and a significant grassed back lawn abutting to the lake that is popular for family reunions and events. During the Winter, UTA (public transportation) has regular pick-up times at Lakeside Village to Snowbasin. I have been listing my property on VRBO since 2004! I have many happy repeat customers. Come experience the art of living well! Attached Garage-great for cold winter mornings and safe for your expensive equipment. Queen Sleeper Sofa with memory foam mattress toppers for added comfort!!! I love skiing in Utah and fell in love with Snowbasin and Powder Mountains. My family gathers for ski vacations as often as possible. I bought this condo to be near family and friends and to have a gorgeous escape when I leave the chaos of work in Atlanta behind. I have outfitted my second home with everything I could want when I am on vacation. I am sure you will find it very comfortable and well appointed. I like vacationing in such incredible surroundings. If you need anything, let me know! I have been offering this condo through VRBO/Home Away since January 2004 with great success and savings for my guests!!! We fell in love with Snowbasin ski resort back in 2002. We bought our first condo with our extended family, and then each family bought their own condos since we all wanted to go frequently and needed more space. Pineview reservoir, the mountains and Snowbasin offer year round activities and beauty and we just love it there! Shuttle service through UTA (for a fee) is available to Snowbasin. Shuttle service through UTA (for a fee) is available from the Power Mountain shuttle parking lot near Valley Market (Eden) on the opposite side of the Ogden Valley from Lakeside Resort Properties. Onsite amenities at Lakeside exercise room, outdoor pool and kiddie pool (open from Memorial Day-Labor Day), large community hot tub (open year round), 2 tennis courts and a trail down to the lake. Being the closest accommodations to Snowbasin, we get up in the morning, looking at the mountain from the huge windows or decks and can tell it is going to be an incredible day! Sitting in the hot tub at night or watching the sun set after a long day of skiing is a relaxing way to end the day! This condo is very unique, it is a 3 bedroom, with two separate lockouts, fully equipped condos that share an entry and landing, but have separate keyed entries to their own condo on separate levels. We have celebrated many New Year's eves and Super Bowls with 30+ family and friends. With two family rooms there is great space to gather and enjoy life. The condo is incredibly warm and romantic when it is just two of us! We absolutely love that we can use the condo as two separate condos, or one huge condo! Please let me know how I can assist you. toilet, Half bath off Great room! Quaint resort, Lakeside Village, on the shores of Pineview reservoir. Lakeside Resort is located on the shores of Pineview reservoir. 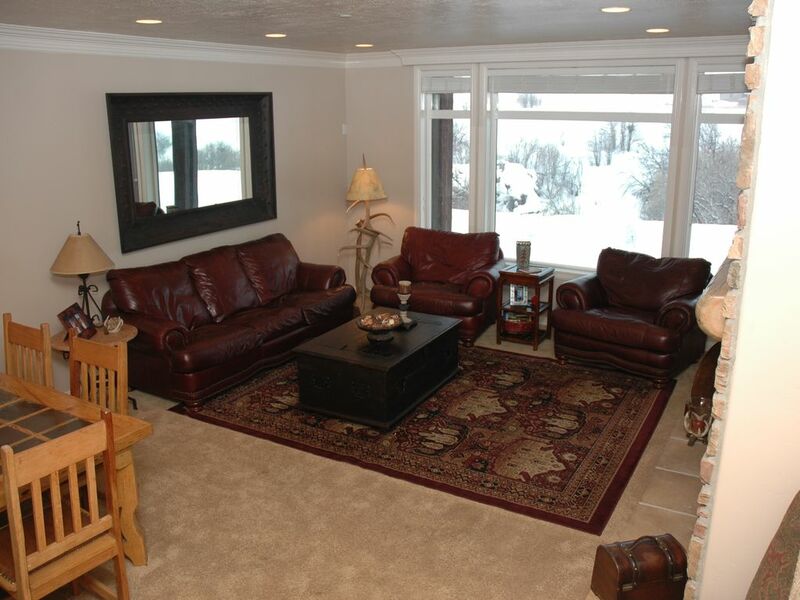 The best views of Snowbasin Ski Resort are available in this ski condo! Great heat, including additional baseboard heaters to customize your comfort. Private, Attached garage with ski, board and sport racks for easy storage. We also provide hot tub towels!!! For sanitary reasons, we do not stock anything other than coffee, salt, pepper, packets of sugars, sweeteners, creamers. Unique custom dishes, This is not your basic rental condo!!!! Condo offers a very well equipped kitchen each with place settings for up to 12 guests! Large dining area! Custom made table. Available with one bedroom option or three bedroom option. Bring your boat, launch it at the State Park next door! Patio is for 2 or 3 bedroom condo options. There is a step into condo. Condo is not ADA but would be pretty easy with a wheelchair if one step is manageable. Private hot tub on balcony. Two large independent condos can be combined for larger groups. Dining table, microwave oven, Luxury Linens provided, Hair Dryers provided, Huge Closets, Ceiling fans, Crock Pot, Electric Griddle and Skillet, large Garage with ski/board racks, additional free street Parking, Daily or weekly housekeeping available. Uniquely able to be rented as 1, 2, or 3 bedroom condo close to Snowbasin Ski Resort! This is a fantastic space to stay. Very nice decor. All the luxuries of home. And most of all comfortable and feels like home. So easy and convenient to access and a short drive to amazing skiing. Great comfortable place with everything you need and great views. Holly is very responsive if you need anything. Location is great. Condo is exactly as described and exactly what we were looking for. Holly was very responsive. We would definitely stay there again! I am happy to hear! I love repeat guests and can't wait for you to come again! I liked the location, the view, the size and hope to return and enjoy owner Holly's hospitality for my next ski trip to Utah. I hope you have a chance to come again soon! Summer is awesome! The condo and surroundings were beautiful. The pictures don't do this place justice. Although the last night there the neighbors at 35A were very noisy, but I'm sure it was just a family having a good time. I would definitely stay here again. I hope you have the chance to come again! Alta, Snowbird, Park City, Deer Valley, The Canyons, all less than an 1 hour away! Skiing, Cross country, Snowshoeing, Canoeing, Snowmobiling, Hiking, Biking, Hot Air Balloons!!!! This condo can be rented as a one or two or three bedroom condo. Please call owner for rates of one or three bedroom option. One bedroom has a private hot tub, garage and sleeps up to 4. Hot tub hours 7 am- 10:30 pm -other times are considered quiet hours in consideration of guests in other units.